With graphics inspired by the laid back times of the 60’s and 70’s, we don’t really think “the man” should bring you down with rules! So you can play anyway you want, just be cool and have fun. In case you do want some suggestions, they are included below. A beanbag landing on the target scores points, if and only if, the black dot on the beanbag is completely within a numbered colored area on the target below. Once a beanbag lands on a target, the points that the beanbag earns cannot be changed by having another beanbag hit and move it. In all games, players alternate throwing one of their beanbags at the target. In the first game, the younger player makes the first toss to start the game. In subsequent games, the losing team would make the first toss. When both players have thrown their 3 beanbags, it counts as a round. After a round, the player with the lower score starts the next round. If a beanbag lands in “Bummer (lose your turn)” a player does not throw a beanbag the next time it is their turn and would only throw 2 beanbags in a round. We recommend putting a mark down on the floor about 4 feet from the target and requiring players to toss from behind that line. The distance can be adjusted based on the ability of the players. For players of different abilities, the toss line distance can be varied between the two players to try to give the lesser player an advantage. The player to score a total of exactly 60 points wins the game! If a player lands on a number that would have their total go over 60, then they subtract that number from their score! For example, if a player were at 50 points and their next beanbag toss scores 25 points, then their new total would be 25 (50-25). Same as above, players just need to score 70 points. 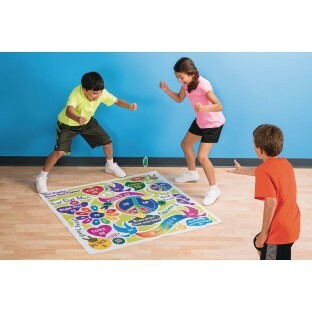 Players can actually agree prior to the start of the game to race to any number, we recommend 60 and 70 to stay in the theme of the game and to create quick games. Players pick a point total to race to, we recommend 225 as a starting point. In this game, if a player scores two of a same point value during a round, they double the points for the matching values. If they score 3 of the same value during a round, they triple the value of their points! Players still have to reach the desired point total exactly to win and if they go over, they still subtract the value of their last toss including double or triple score values. The first player to score at least one 5, 10, 15, 20 and 25 point toss, wins! Players are allowed to score more than one of any point value, with no penalty. For this game players will use poker chips (like our GA2048) or coins (like pennies). Each player starts with an equal number of chips or coins (try starting with 7 each the first time you play and adjust as you go). Players stand behind the starting line and toss a chip onto the target. Players score points for a chip or coin that lands completely within an area with a point total. The player with the highest point value wins all the chips. If two or more players score the same point total, those players throw another chip until one player wins. The winning player wins all the chips tossed since the end of the previous round including all those that did not stay on the mat. For a faster game, players can spread out an equal distance from the target and all toss at once, just make sure you know who tossed which chip or coin! Once a player runs out of chips, they are out of the game. Play continues until one player wins all the chips. 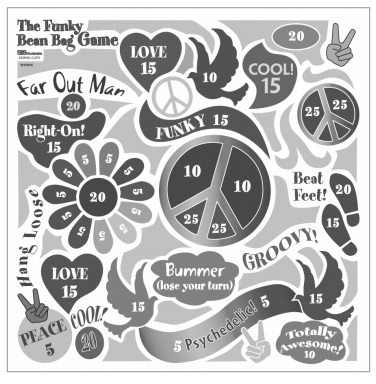 Our funkified retro beanbag game proves that fun never goes out of style! 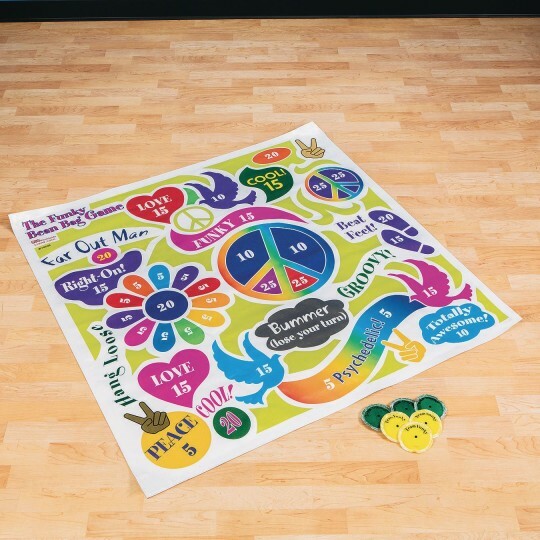 Bring back memories or create new ones with this throwback favorite. Includes a 46-1/2" x 46-1/2" heavy-duty vinyl beanbag target, six 3-1/2" diameter beanbags and instructions.